This article explores history and origin of dancing in Indian sub-continent. The story of the Western world, from classical Greece up to the present day, is one of wars and famines. But it is also a record of ways of life that changed as Western man invented new ideas and machines to improve the world in which he lived. The story of the Eastern world is different: it is a story also of wars and famine, but in a continent where man accepted problems, seeking less to solve them than to find relief in religious meditation. Thus, in most Eastern lands, ways of life and art have remained the same for many centuries. Indian dancing, unlike that of Greece, is today-as it was perhaps 2000 years ago-the oldest dance tradition of the cultured world. 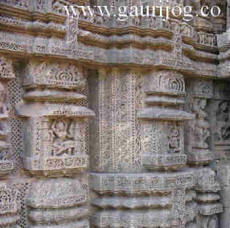 We have no need to guess the movements of the gestures, frozen in time on temple carvings centuries ago. Indian dance, like the dance of Greece, is one of mime and gestures. Perhaps, when Alexander the Great invaded India in 327 B.C., he introduced from Greece some of the dances of that land. Or possibly, some centuries before his time, the dance of India had spread to Greece, where it survives to this day in works of art alone. derived from the world’s first cultured people, whose priests declared the stars moved in a dance. In southern India, temple sculptures show the god as Nataraja (King of Dancers). Statuettes with many arms perpetuate his gestures. 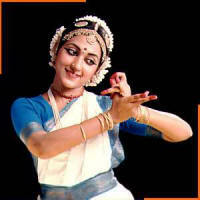 Others depict Parvati, Siva’s wife, inventor of the softer, women’s dances. The steps and gestures of all Indian dances performed today are derived from a book: Bharata’s Natya Sastra (the science of dancing). Its Sanskrit manuscript was written down about the time that Christ was born. Its teachings fade in the vast distances of ancient myth. The gods, tradition says, entrusted the sage Bharata with the secret of the dance. Bharata’s writings, some still preserved on palm leaves, make Indians the only people in the world to have a textbook of art as a semi-sacred book. An Indian dance, performed in temples, was not a popular pursuit for leisure hours. Skilled artists, through its movements, had to imitate the thoughts and feelings, joys and sorrows, of gods and men. Indian dancing may well be the most complete on earth. Each part of the body has its special movements. To learn how to control them takes more than a dancing lesson once a week. 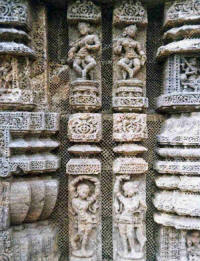 Temple dancing girls were devadasis – servants of the god. Their lives were dedicated to the dance, which was an act of worship, not entertainment. Temple carvings show devadasis as winged nymphs, apsaras, strangely like the dancing angels of early Christian belief. Today, few temple dancing girls remain, but girls still learn their art. The best age to begin is eight. The would-be pupil must find a guru (teacher), who may live in a village far away. If he accepts her, she becomes a member of his household, like an apprentice in a medieval town. The teacher then instructs his pupil in the knowledge he has gained from an unbroken chain of son-and-father links that stretches back perhaps for 80 generations. He/she teaches her/him the movements of the anga, “limbs” – head, hands, arms, chest, hips, legs, feet; those of the pratyanga, “intermediate parts” the neck, shoulders, palms, back, stomach, thighs, ankles, knees, elbows, wrists; those of the upanga, “lesser limbs” – the eyes, eyebrows, eyelashes, cheeks, nose, lips, teeth, tongue, chin, mouth, jaw. The Natya Sastra describes positions for them all, nine for the head, eight glances of the eye, six movements of the eyebrows, four of the neck and at least 4000 mudras (gestures of the hands). A mudra may imitate an actual object; a swimming fish, a flying bird, a lotus flower in bloom. It also shows an abstract mood: love, hate, fear, surprise. A skillful dancer can tell a story without words. The dance itself is in accordance with nine moods or rasas, which the Natya Sastra has described: fury, fear, love, heroism, comedy, pathos, admiration, revulsion, meditation. As in all ritual dances, music and dance are one. Unlike Western ballet, dancers and musicians do not repeat a ready-made pattern of steps and notes. They improvise their complex rhythm: drums, singer, and dancer’s ankle-bells all blend miraculously to invoke the gods. true beauty of the dance remained obscure until the present century. Thanks largely to the enthusiasm of Anna Pavlova, the famous Russian ballerina, Indian dancing today claims countless admirers. We have talked as if all Indian dances were one. Four great schools of dancing have developed from one common source: two in the south, two in the north. Each has its own version of the Natya Sastra gestures. The oldest is south India’s Bharata Natyaam school. Bharata may derive from words that mean “outward expression of spiritual feeling,” “melody,” and “rhythm.” This is the dance that temple sculptures show. Once, only devadasis performed it. Many people still think of it as meant solely for women. But some of the greatest dancers who have helped revive its fame are men. As in all Indian dances, hands play an important part. Their rich language of gestures can portray emotions, moods, or objects. So beautiful are these mudras in themselves that one can talk of “dancing hands.” Kathakali (danced drama) comes from India’s southwest coast. Performers wear billowing skirt-like garments inspired by clothes Portuguese settlers wore 400 years ago. But Kathakali itself may be much older ~ three kinds of characters-the virtuous, the heroic, and the devilish-enact the life of gods and demons. Originally, only male dancers took part; Kathakali would test the stamina of the strongest. Before it even starts, trained artists spend four hours applying the performer’s complicated makeup. In the performance, which may last all night, mime plays a tremendous role. Performers must perfect nine separate eyeball movements. Unlike the temple dances, Kathakali appeals to all. It takes place in the open air, upon a platform where a large lamp adds its softly flickering light to the mysterious effect of costume and makeup. From Manipur, in northeast India, come the soft, graceful Manipuri dances depicting the charming legends of the god Krishna. The land of Manipur, “created as a dance floor for the gods,” is rich in folk dance. Rabindranath Tagore, playwright and poet, used its dances when working to revive forgotten native arts. Kathak is also from the north: it is a court, not a religious, dance, although it tells the legends of the gods. It flourished in the time of Moslem conquerors who, unlike Hindus, looked on dancing as entertainment. Thus its purpose is akin to Western ballerinas. Its elegant, exciting, lightning turning steps are not seen elsewhere in India. Artists who painted the famous Persian miniatures often depicted scenes of Kathak dancers entertaining princes. Dance gestures in India and Southeast Asia are very much alike, for the story of the dance in Burma, Thailand, Malaya, and Indonesia is the story of the spread of Indian arts: by sea from south India, by overland routes from the north. Well over 1000 years ago, south India’s warrior kings invaded Ceylon. Later, ambitious merchants spread peacefully to Burma, taking trade and Indian modes of life. Later still they settled in Thailand, Malaya, and Indonesia. With them went Indian dancing. Indian mudras were often forgotten, but eastern Asia’s supple gestures clearly reveal the dance art that originally inspired them. 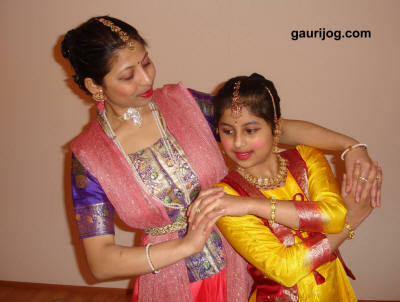 We at Indian Dance School by Gauri Jog, will take you around the world to go over different forms of dancing. We believe that one should have knowledge of all dances. This way you will have choice also when selecting a particular dance type.